For a larger version of this same pattern, use the recycled plastic hobo handbag pattern. This pattern provides for a purse that measures 14 inches wide and 10 inches long. This really is a fun and cute little purse to crochet using recycled materials. 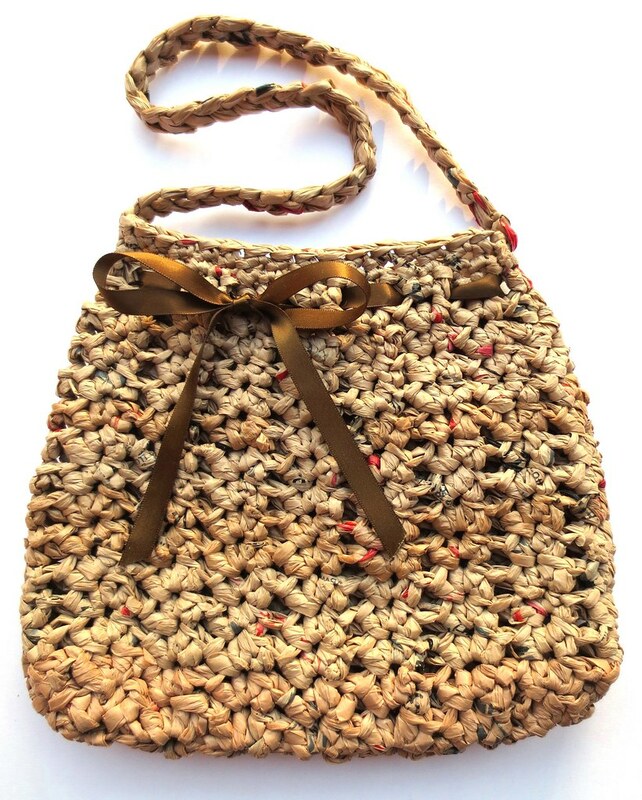 Many people say the brown plastic bags resemble a straw woven bag once crocheted into a purse. This is a great project idea in which you can utilize those old plastic sacks leftover from the store to create a new and useful item. So cute! I love the ribbon threaded in. That’s such a nice touch. The handle is so delicate; it’s beautiful, but how well does it wear? In my experience, after about 6 months handles that are much thicker than this stretch out and are unusable. I love how this kind of bag works up, with the red and black bits showing. Where do you get them? This is such a lovely purse. How thick do you make your plarn? It looks so delicate! @Renee – Thanks! These are bags from Safeway. I cut my bags about 1 inch wide and use the looping method to make plarn. As for the handles, I think they hold up pretty good. I can use a grocery tote for many years. A few years ago I finally had to retire one as it was just falling apart. I used it for 5 years so I think it held up pretty well. I did have to repair the handles once but I used it all the time. My current plarn grocery tote was made in 2012. It is still is in great condition and the handles are just fine too. I see you have a blog about recycled plastic too. Best wishes and hope to see you around again.